Erecting a garden shelter in your landscape, no matter the yard size, makes your yard appealing and more usable. There is a variety of options for you to select from when deciding on the garden structure. Open and airy or screened and enclosed; simple or ornate. Whatever style you choose for a garden shelter, it should be one, when completed, that gives you a comfortable feeling and lets you be in touch with nature. Garden structures with an open roof are probably the most popular and the easiest to construct. There are many styles of open roofed garden structures, depending on the look you want for your yard. More casual, informal open roofed garden structures are in the form of arbors or trestles. These structures will also usually have open sides, but then are 'closed' and roofed with vines for wind barriers and privacy. A pergola is a more formal open roofed garden structure, but still will generally have a vine type plant growing up and over the structure. Popular vines for open roofed garden structures are climbing roses, wisteria, jasmine, trumpet vines, and grapes. You may want open sides to your garden structure, but need a solid roof. Loggias, porticos, and gazebos are all garden structure designs with a solid roof, but open sides. 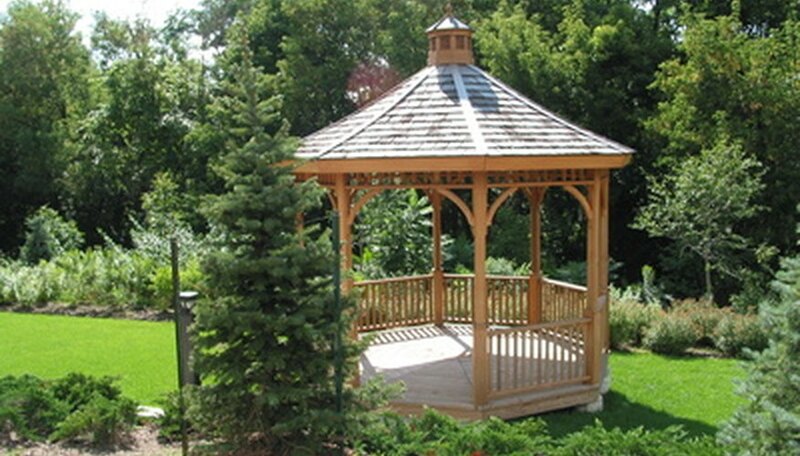 Gazebos, large or small, have always been popular as a haven to enjoy your landscape. They can be completely open sided, or partially covered with open weave latice. Portico's and loggias are more formal, with a loggia often situated to overlook a formal courtyard, while a portico is attached as an extension to your home or pool house. As inviting as open sided structures are, sometimes, because of the weather or insects, an enclosed garden structure is more desirable. Structures with roofs and screened sides, referred to as screened in porches, are most common in locales that require protection from the elements in order to peacefully enjoy your garden. There is another type of enclosed garden structure that is becoming more popular as new designs become available. It is the potting shed, or garden shed. No longer are they relegated to be hidden, but are incorporated to become part of your landscape, sometimes the focal point of your garden. These sheds are unique, constructed in wood, with windows, and embellished trim. Larger sheds often house a small art and craft studio, or office. The design and style of your garden shed can range from rustic to quite formal.